Want to see two characters from Lonesome Dove taking a selfie? 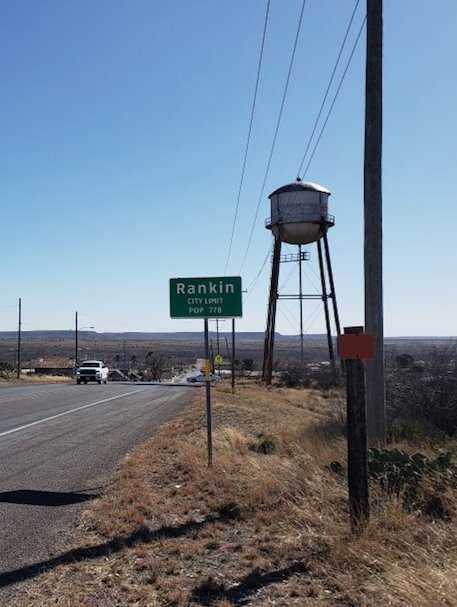 Get yourself to Rankin, Texas. The town is perched atop the Edwards Plateau in the Middle of Nowhere, population 778. 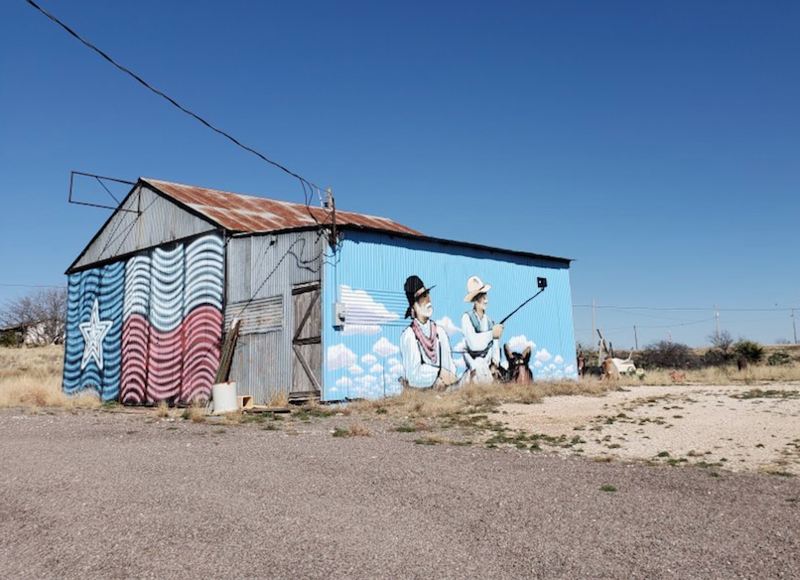 I have no idea what the town is best known for, but I’ll put my money on an old corrugated tin building decorated with a funky Texas flag and portraits of Augustus “Gus” McCrae and Woodrow F. Call of Lonesome Dove. Someone with a puckish sense of humor painted the pair on horseback, with Call taking a selfie. Tommy Lee Jones would probably approve. The “Findagrave” website often has errors in its unsourced obiter dicta, but the tombstone pictures and obituaries posted there are pretty good evidence. The Fairview Cemetery in Midland has a tombstone for F. E. Rankin (“father”), 1856 – 1916, and Eliza Rankin (“mother”), 1862 – 1953. Better yet, there is a Midland County death certificate for Robert Porter Rankin (1890 – 1 Nov 1962). It identifies him as a son of F. E. Rankin and Eliza Smith. Best of all, it says Porter was born in Belt Buckle, TN. That town is in Bedford County, telling us where to go look for Finis et al. before they came to Texas. With a name like “Finis” and the additional information, tracking this line was a piece of cake. There is a marriage record for F. E. Rankin and Elizabeth Smith for 27 Jul 1879 in Bedford County, TN. At age 5, Finis and his younger brother Porter were listed in the 1860 census for Bedford County with their presumed parents Robert and Matilda Rankin. The 1850 Bedford census adds a middle initial: his name was Robert D.Rankin, and there was a David G. Rankin, a child, in the household. The 1880 census identifies David G. Rankin as a son of Robert D. and Matilda. At this point, bells began to ring in earnest. The names David G. Rankin and Porter Rankin are firmly planted in my memory … and in my family tree software. David G. Rankin was a son of Samuel and Eleanor (“Ellen”) Alexander Rankin of Lincoln Co., NC – my ancestors. I have written several article about Sam and Eleanor on this website. Here is one of them: http://digupdeadrelatives.com/2017/10/22/samuel-rankin-abt-1734-abt-1816-m-eleanor-alexander-new-post-replace-old-ones/ David. G. Rankin’s wife was Anne Moore Campbell, and they had a son, Rev. James Porter Rankin, who died at age 26. 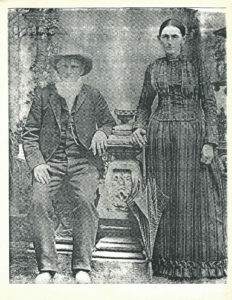 David G. and Anne Rankin migrated from Lincoln Co., NC to Rutherford Co., TN. A deed there identifies a Robert D. Rankin as a resident of Bedford Co., TN; other records make it clear that Robert D., father of Finis, was a son of David and Anne. And that’s enough for Rankin, TX: I’ve just written more words than there are people in the town. And whoda thunk I’d find relatives near there. A friend who writes a travel blog called Wanderwiles took these two pictures and kindly sent them to me. Texas Land Title Abstracts, Certificate No. 982, file No. 85690, 640-acre grant to F. E. Rankin dated 26 Oct. 1911. 1910 federal census, Midland Co., TX, household of Finis E. Rankin, age 54, b. TN, parents b. TN, with wife Elisah (sic, Eliza), 48, TN/TN/TN, and son Porter Rankin, 20, TN/TN/TN. 1900 federal census, Midland Co., TN, T. E. or F. E. Rankin, b. Jan 1856, age 44, married 20 years, cattle raiser. 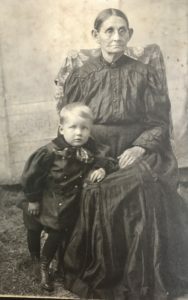 Household includes wife Eliza, b. Feb 1862 who has had 3 children, all living, daughter Maud, b. Apr 1880, son P. B., b. Dec 1881, and son Porter, b. Feb 1890. The deceased isn’t ever around to give his/her date of birth, and my experience is that children often haven’t a clue what year their parents were born. Tombstones are subject to that possibility. AND, once in a while, people have been known to shave a few years off their ages, a frequent occurrence in census records. 1860 federal census, Bedford Co., TN, District 4 has household of Robert Rankin, 45, farmer, $16,500 realty, $15,000 personalty, b. TN. Also listed in the household (all born in TN, and all with the surname Rankin, were Matild (sic, Matilda) 35, Nancy 21, David 19, Thomas 17, Jame 16, Ellen 13, Susanah 11, Malinda 9, Virginia 7, Finis, 5, and Porter, 1. 1850 federal census, Bedford Dist. 4, Robert D. Rankin, farmer, $7K real property, b. TN. Matilda Rankin, 33, Nancy A. Rankin, 10, David G. Rankin, 9, William Thomas Rankin, 8, Janes? C., female, 6, Martha E., 4, and Susannah M., 1. 1880 federal census, Bedford Dist. 5, David G. Rankin, 38, farmer, b. TN, parents b. TN, wife Laura T., 30, NC/NC/NC, sonsRobert E. Rankin, 12, Wm A Rankin, 10, Leon Augustus Rankin, 7, Albert E. Rankin, 2, and Osman G. Rankin, 1. Rutherford Co., TN Deed Book Z: 93, bill of sale dated 15 Jan 1842 from Robert Rankin of Bedford Co., TNto Martin Alexander of Rutherford, an enslaved person. See also Rutherford Co., TN Deed Book 1: 523, Robert D. Rankin and William C. Rankin, administrators of the estate of their sister Mary (Rankin) Montgomery. Mary M. Rankin married Joseph A. Montgomery in Rutherford County in 10 Sep 1831.